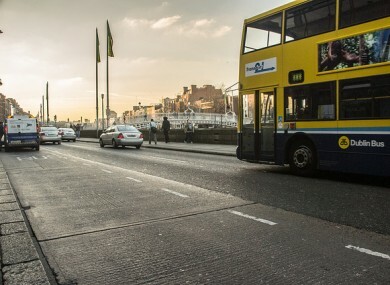 A 33-YEAR-OLD man is in critical condition after being seriously assaulted on Aston Quay in Dublin last night. The assault occurred at 9.30pm and gardaí say the suspect is a man in his 20s or 30s, well built with dark hair. He was wearing a light coloured t-shirt, grey hooded top with white writing on the front and grey tracksuit bottoms. Before the attack, the suspect took off his hoody and t-shirt, then put them back on afterwards. He left the area in the direction of Westmoreland Street in the company of two other men who were wearing dark tracksuits. The victim is in critical condition at St James’ Hospital. Gardaí are now appealing for witnesses or for anyone with information, particularly those in the vicinity between 9.15pm and 9.45pm last night to contact them at Pearse Street Garda Station on 01 6669000, The Garda Confidential Line 1800 666111 or any garda station. Email “Attacker took off t-shirt before assaulting man on Dublin's quays”. Feedback on “Attacker took off t-shirt before assaulting man on Dublin's quays”.